ECR stands for Electron Cyclotron Resonance. An ECR ion source creates multi-charged positive ions and can be used for surface treatment by ion implantation. Further details on ion implantation technology can be found in this White Paper that we released in April 2018. For explanations on the working principle of an ECR ion source, you may have a look at this interactive 3D model. 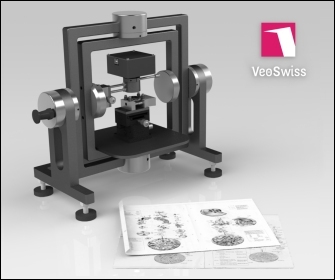 The GyroTracker allows watch-testing laboratories to perform comprehensive analyzes of their mechanical movements in all measuring positions. The instrument performs real-time tracking of the balance wheel elongation to measure isochronism (watch rate vs. oscillation amplitude). The product was commercialized by VeoSwiss. Further details can be found on the dedicated website. This 3D schematic shows a SOI-based microactuator developed for mechanotransduction assays on mesenchymal stem cells (size of the silicon chip: 7 mm × 9 mm). Details on the project can be found on this page. 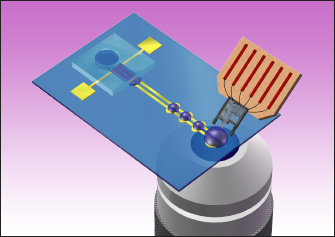 Photograph of a setup using the principle of capillary passive valve to interface a bio-MEMS device with a chamber filled with a culture medium. 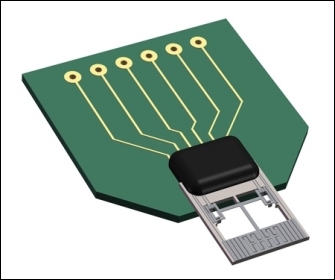 The silicon microchip is partially immersed in Dulbecco's Modified Eagle Medium (DMEM). 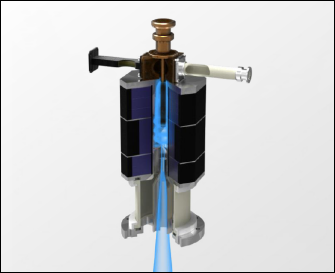 Its electrostatic actuators are kept out of the solution. 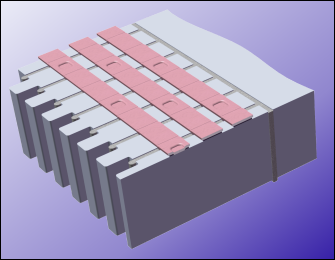 3D schematic showing a 3-phase electrical network obtained by vertical trench isolation of silicon. Operation of a linear stepper micromotor. Operation of a rotary stepper micromotor. This 3D schematic drawing shows the principle of droplet manipulation by liquid dielectrophoresis (LDEP). 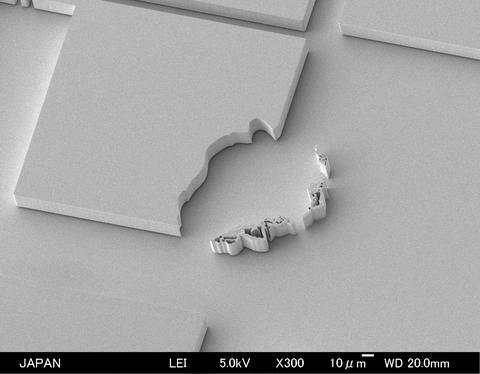 This concept is investigated for single-molecules isolation and their studies with silicon tweezers. 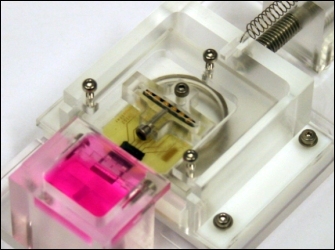 Details on the working principle of the microfluidic chip. 3D model of the microtweezers presented at the 22nd IEEE MEMS 2009 Conference. Requires Adobe® Reader® version 7 or later. 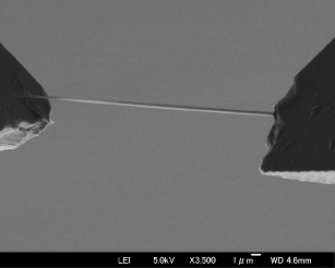 Scanning Electron Micrograph of a DNA bundle captured between silicon tips coated with aluminum. On this picture, the bundle has a mean diameter of about 380 nm. In the article published in Biophysical Journal 94 (1), pp. 63-70, 2008 (DOI: 10.1529/biophysj.107.115980), we study the electrical properties of DNA bundles captured between silicon tweezers. 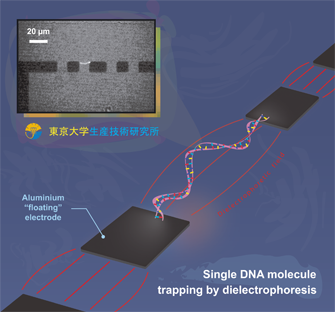 The picture shows a single DNA molecule trapped between floating aluminium electrodes by means of alternating current dielectrophoresis. The image was obtained by fluorescence microscopy using double-stranded lambda-phage DNA labelled with the YOYO-1 fluorescent dye. In the article published in ChemPhysChem 8 (12) (DOI: 10.1002/cphc.200700268), we describe a method enabling the isolation and trapping of single DNA molecules in a microfluidic chip by using consecutively direct current electrophoresis and alternating current dielectrophoresis. Anonymous micrograph found on the Fujita Lab's website (www.fujita3.iis.u-tokyo.ac.jp).